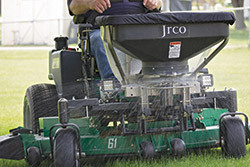 JRCO has an electric broadcast spreader attachment to fit zero-turn, stand-on and walk-behind mowers as well as utility vehicles. With a 2.2 cubic ft. polyethylene hopper and a 120-lbs. capacity, this heavy-duty, corrosion-resistant broadcaster spreads granular and pelletized fertilizer, seed and ice-melting pellets. Electronic speed control accurately maintains spread pattern widths from 5 to 24 ft. Stainless steel vibrating agitator breaks up lumps and ensures superior material feed. Stainless steel bumper protects the motor and fan. A sealed, quick-disconnect wiring harness is standard. Optional stainless screen, side deflector kit and extension wire harness are available.